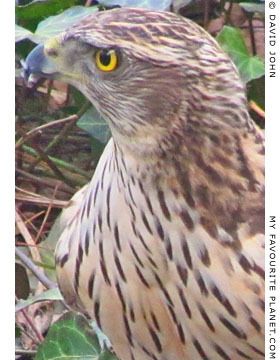 A young northern goshawk tucks in. and observes the workings of savage nature in an urban landscape. WARNING: Some readers may consider the photos below gruesome. 1. A few days before a pigeon had flown at full-tilt at a closed window; a sickening thud was heard as its head hit the double glazing. If this was the same bird, it may have died as a result of injuries sustained in the collision. 2. In the weeks before, Sarkozi the cat had been seen regularly lurking behind trees, as is his habit, waiting for an opportunity to pounce on an inattentive bird foraging on the ground. The over-fed feline is a notoriously amateurish hunter and far too slow to catch most birds, and anyway the feathered community usually shriek in collective alarm when he is on the prowl. But he may have got lucky in this case and made a kill. It would be quite typical for such dilettante domestic moggies not to eat their victims; they often skulk away with what one could imagine to be guilty expression. It is noticable that he has not been seen around here since, and, affecting an unusual lack of curiosity, none of the other local tiger-wannabes have ventured anywhere near the suspected crime scene. 3. 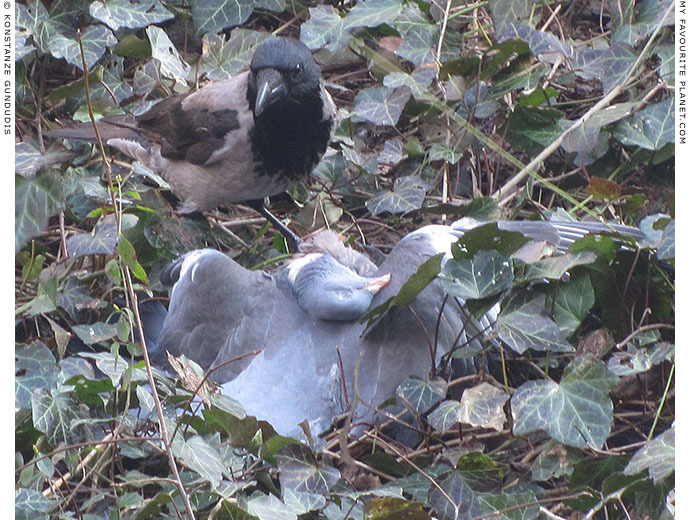 The poor wee thing may have merely died of natural causes: old age, or one of the many diseases which plague urban pigeons. It may have eaten some contaminated human garbage which disagreed with it in a big way. Murders and mysterious deaths are properly the preserve of Edwin Drood (see, for example, Edwin Drood's Column 18 February 2014), and we have no wish to tread on his professional toes here. In any case, as we shall see, the corpse has subsequently disappeared, and the evidence has been scattered by the winds and other forces of nature. This story takes place in Wedding, an inner-city district of Berlin, Germany, and more specifically near the Panke stream, the area around which, as we have noted in previous editions of the Cheshire Cat Blog (for example Snowstorm Blues, 9 December 2010), is surprisingly rich in wildlife. Is a fallen bird worth less than a farthing? The broken victim lay unmolested in the undergrowth for the next two weeks. The tenants of the apartment house had either not noticed the carcass, or considered its fate none of their concern. What does one do with the corpse of a wild animal anyway, give it a decent burial or dump it in the garbage? Is the latter even legal? How does one find out the proper thing to do? These days many citizens are paralyzed into inaction for fear of transcending regulations. In Germany especially, authorities are very keen on issuing writs against people for allegedly breaking obscure laws few laypersons even know exist. Only last year I learned that local nature protection enthusiasts regularly photograph birds' nests on properties as potential evidence: if anything untoward happens to the nests, the property owners or tenants may well find themselves facing a court case. While I am all for nature protection and conservation, and am relatively sure of the good intentions of such protectionists, how does one prove that a nest was destroyed by a cat, a rat or a gang of marauding sparrows rather than a careless tree-pruner? Unfortunately, pigeons appear to have taken no steps whatsoever since to improve their public image as dimwitted nuisances: no matter how often you shoo them away from your picnic or alfresco lunch they will keep coming back for more abuse, all for the chance of a few crumbs. It is notable that in Germany there are groups and societies to protect all kinds of animals (see below), particularly the cute, the majestic and the rare. However, if you search for "Taubenschutz" (pigeon/dove protection) in the internet you will mostly find advertisements for devices intended to protect property from pigeons and doves: nets, metal spikes, combs, grills, etc. There appears to be no lobby to stand up for the Columbidae, although one Berlin newspaper last year quoted local animal protection agency employees who stated that anti-pigeon devices at Zoo railway station were trapping the birds and causing agonizing deaths. One official, Professor Horst Spielmann, suggested luring them to specially-constructed pigeon towers, at which they could be better controlled and their eggs removed in order to counter the "pigeon problem". Such pigeon concentration camps already exist elsewhere. What happens to all the dead birds? 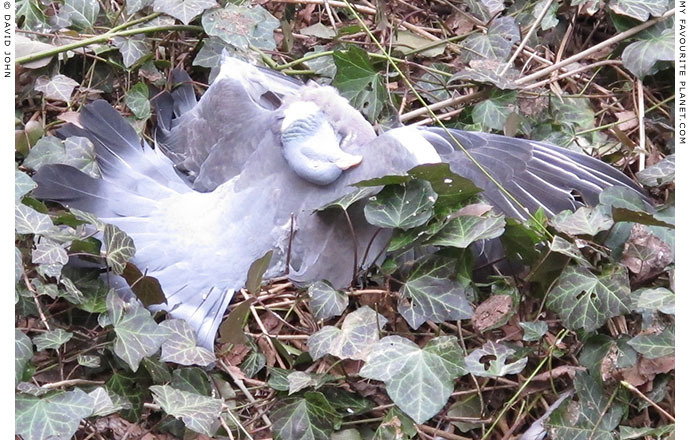 How come there are millions of birds living in our towns, but we rarely see a dead one lying around? I've heard the theories that various scavenging animals and street cleaning departments keep our cities free of deceased fowls, and that many birds seek hiding places to perish. I don't buy any of this. 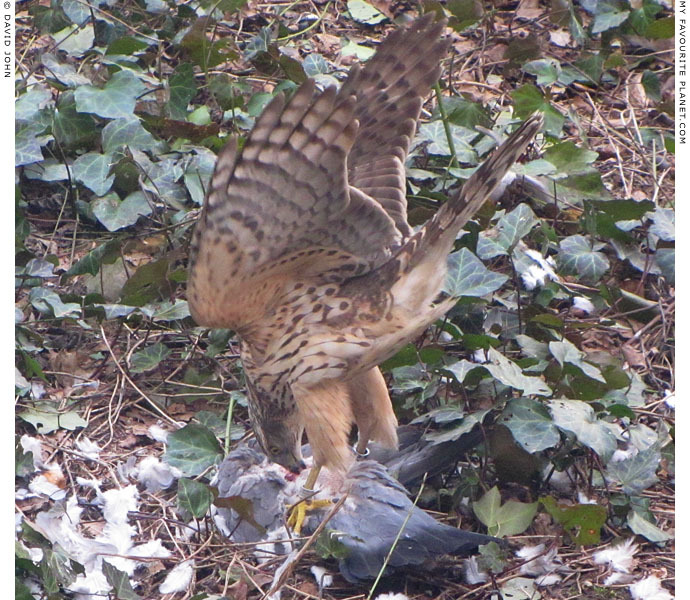 Statistically, there just can not be enough urban scavengers to mop up all the carrion, and if there were you would expect to witness these industrious creatures at work more often. And hey, that coke can has been lying in that gutter for weeks; if the street cleaners can't get around to that, how are they going to cope with so many squelchy cadavers? When will somebody finally tell us what is really going on here? Rats are often the first on the scene when it comes to urban scavenging opportunities, and the various types of crow are also among the usual suspects. But everybody seemed to acting with extreme caution and it took a long while before anybody even feigned an interest in our ex-pigeon. Such timidity came as a surprise, especially given the brazen cheek of magpies and crows which often strut around the streets here as if they owned the place. I once watched a magpie stealing catfood from right under the nose of a dozy tom. The bird even moved the catfood dish further away from the pampered menial, presumably to afford it a better headstart should it be forced to make a hasty retreat. Perhaps, because the winter has been unusually short in northern Europe this year, there are more easy pickings to be found elsewhere. This hooded crow (Corvus corone cornix; in German, Nebelkrähe) was the first to take the plunge, but after a few hasty pecks, it was off again. Nobody, it seems, was willing to risk a showdown with Sarkozi the Truly Awful. Finally, at the dimming of the day, almost three weeks after the demise of the pigeon, one of the big players unexpectedly weighed in. 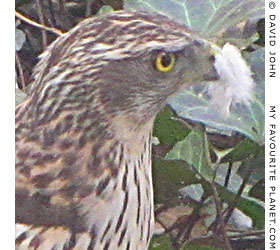 This is a northern goshawk (from the Old English goose-hawk; scientific name Accipiter gentilis; in German, Habicht), one of a handful of species of birds of prey which live in the woods, parks, cemeteries, private land and industrial estates in and around Berlin. 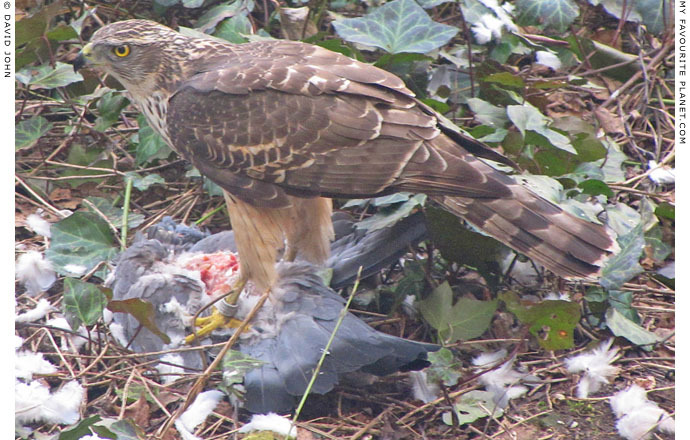 There are an estimated 1,000 breeding northern goshawk pairs in the city. They can often be seen soaring high above the buildings or perched, well-hidden in trees, but it is rare to see one of these shy creatures at ground level. Pigeons are their preferred prey, which is one reason they thrive here, and doubtless a factor in the support they are afforded by humans. 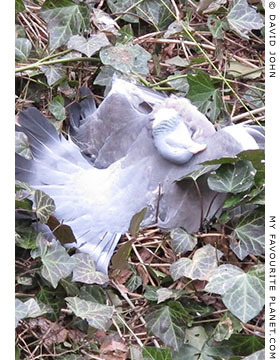 to eat an unplucked pigeon. 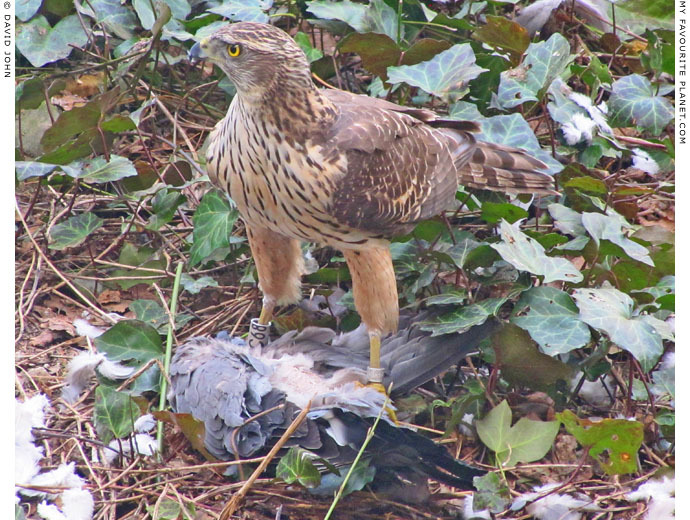 Northern goshawks receive extra-special protection under German nature protection legislation, and because they operate within relatively small radii (less than 30 km) they are popular with "twitchers" (bird-watchers) and have been particularly well observed and documented. In Berlin northern goshawks chicks have been fitted with aluminium identification rings by volunteer workers since the early 1980s. One volunteer, Rainer Altenkamp, of the local branch of the German nature conservation cooperative NABU (Der Naturschutzbund Deutschland e.V. ), who has been ringing the birds in east Berlin for over 20 years, has been named a local hero (see the article Der Held der Ringe at www.berliner-helden.com). Since May 2012 the ringing of the birds has also been supported by a five-year project of the Stiftung Naturschutz Berlin. "We ringed the male northern goshawk C68, along with a brother and two sisters, on 3rd May 2013 at Brutplatz Luiseinsel, Tiergarten [a central district of Berlin]. At that time the bird weighed 570 grams, had a wingspan of 116 cm and was 18 days old. This is the second report on the bird since he became independent. The first sighting was on the edge of Schlosspark Bellevue, Tiergarten on 10th February 2014." The late 18th century Bellevue Palace in Schlosspark Bellevue, incidentally, is the official residence of the President of Germany, who featured in the previous Cheshire Cat Blog. 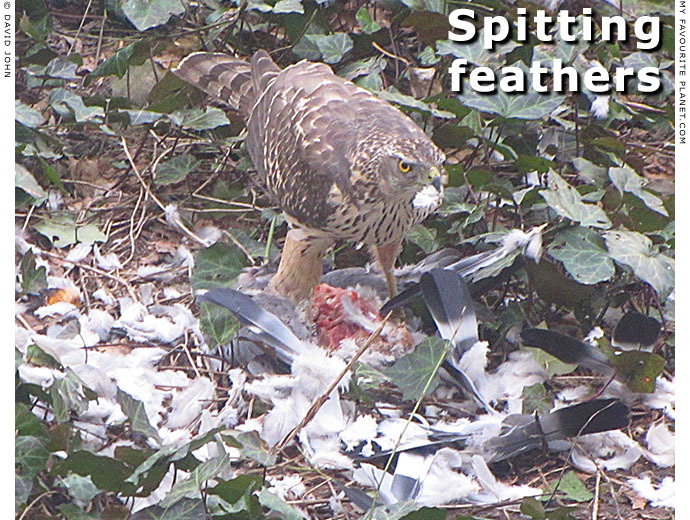 In a series of swift pecks our northern goshawk C68 made short work of the pigeon's remains. Between dainty beakfuls it kept its sharp yellow eyes open for trouble. 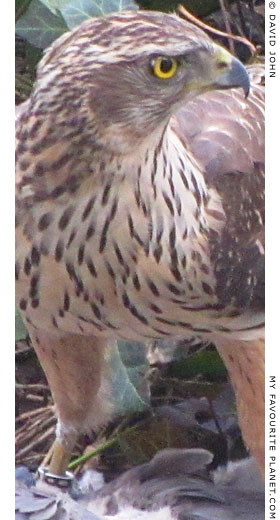 Not that Sarkozi or any of the other local kitties would have been anything like a match for this ferocious young hawk. Despite having some sympathy for the pigeon, I felt quite priviliged to have witnessed the visit of this relatively rare bird. It is undoubtedly an impressive beast - magnificent even. I was also left feeling very fortunate not to have been born a pigeon (yet, so far as I am aware). You can find plenty of wildlife photos from other parts of the world by browsing the pages of these blogs. My Favourite Planet welcomes contributions of photos, drawings, articles, stories and poems about nature, wildlife, travel and other subjects. Please get in contact. 1. As you may expect, in highly-organized Germany there is an authority, society, cooperative or working-group which concerns itself with just about any issue, cause or aspect of life that you can possibly imagine, as well as several you have never thought of. In some cases there are dozens of organizations covering the same turf, each with its own policies, stances and opinions. A plethora of professionals, an avalanche of amateurs and a copiousness of committees. newspaper report by Uwe Steinschek, BZ, Berlin, 29 May 2013. In German all kinds of pigeons and doves are known generally as "Tauben". The word "Taubenabwehr" (pigeon defence, or defence against pigeons) more properly describes methods for protecting property against birds; often sparrows and other species are considered the unwanted guests. While "Taubenschutz" is frequently used, this, strictly speaking, ought to mean protecting the birds, as in "Naturschutz" (nature protection) and "Tierschutz" (animal protection). 3. Norbert Kenntner, Chlororganische Pestizide, polychlorierte Biphenyle und potentiell toxische Schwermetalle in Organproben von Seeadlern und Habichten (Chlorinated pesticides, polychlorinated biphenyls and potentially toxic heavy metals in organs of white-tailed eagles and northern goshawks), thesis, Freie Universität Berlin, 2002.
project, website or publication, please get in contact.